Harry Midgley was re-elected as PCC Croquet Club Chairman at the AGM this evening. This followed the re-election of all of last years committee save the retiring Ann Norman (Social Events and a GC all-comers ringmaster) and Derek Whitingham (Secretary). Both retirees were thanks sincerely for their time in committee service. Pat Eades was the only new face to join the committee for the 2016 season. At the annual prize giving dinner that followed, here was a good spread of different trophy winners from our season-long competitions and day tournaments. Charile von Schmieder did 'The Double' again by being our Club Champion at both AC and GC, after a couple of years missing out on the latter title. Roger Goldring rounded off a great season with an appearance at the National Final of the CA's B-Level Series at Hunstanton. He met up with familiar faces from the B-Level circuit where he was twice a winner this year, earning the right to be in the National Final. Roger did well against a strong field, winning 50% of his 15 games over the weekend, but not as well as High Wycombe's Ian Shore who won the title on the who beat whom rule from Northampton's Peter Dowd. 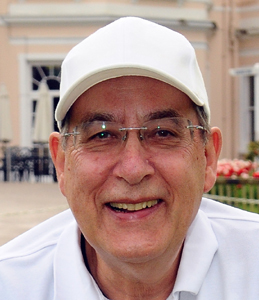 Phyllis Court's Chris Roberts directed the whole Series and managed the final for the CA. Frances Colman will sit on the Council of the Croquet Association (the governing body of our sport in England) in 2016. This follows her election to the post of Southern Croquet Federation Representative to the CA, at the SCF's AGM today. 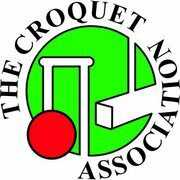 The CA Council is where all the big decisions about croquet nationally are taken and they oversee the work of a number of committees that deal with all aspects of croquet administration. The Handicap Committee of the Croquet Association (on which our Frances Colman sits) are to recommend to the CA Council, the adoption of a new system for GC handicapping for 2016, which will do away with the unpopular (yet mathematically pretty sound) 'effective' handicaps. This news system, which is work of three top croquet playing university maths lecturers, was extensively and successfully trailed in the East Anglian Federation area in 2015. A few players will see their handicaps adjusted up or down when conversions to the new system take place, but most will be unaffected. Under the new system, players currently playing off 2 and below will have their handicaps pegged to their National and World Ranking grade, and for players 3 and above there will be a mathematical re-calculation undertaken by club handicap officers. New style handicap cards will be issued to all. - More details in due course. We are sad that one of our oldest members, lovely Barbara Jenner, passed away on Saturday (21st). Barbara continued playing into her 90's and although very frail in her later years always took a very keen interest in croquet at Phyllis Court and the achievements of her club mates elsewhere. 1 December - Barbara's funeral was held today at Shiplake Church and was attended by a number of PCC Croquet Club members. 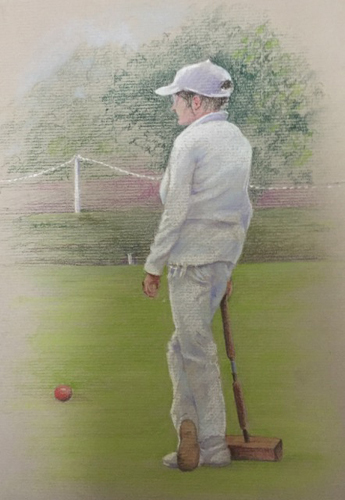 Denese Kier has addred a new image (right) to her wonderful gallery of Phyllis Court croquet players. Do you recognise this player? - Frances has also taken on the post of Southern Federation AC Handicapper and will continue as the GC Leagues Manager. Chris Roberts continues as SCF Chairman and Raymond Wood will again undertake the annual independent review of the SCF accounts. So Phyllis Court are well represented at the heart of both Federation and National Croquet. - The SCF will run the same six League Competitions in 2016 and continue with the same arrangements for any necessary play-off finals. Final will likely be required for the handicap leagues and these will again both be staged at Winchester, on September 11 (AC) and 13 (GC) (to be confirmed). - The SCF handicap doubles tournaments for club's representatives are also unaltered, and will again be hosted at the area's top venue Hamptworth on June 18 (AC Armada) and 19 (GC Solstice). - The SCF handicap Champion of Champions tournaments for 2016 do show changes however and, by popular agreement between clubs represented at the AGM, will now take place at the start of the 2017 season, so as to avoid end of season complications and hopefully to ensure the available of more club's handicap champions. Phyllis Court's Ian Norrris coceded a mountain of extra turns to win the SCF HAndicap Champion of Champions title for 2015. Giving the lie to low handicapped players being over penalised by the handicapping system, Norris, playing off 1 (meaning an 'effective' -2) saw them all off to win for the firts time. Richard Jenkins managed the procedings at Hamptworth, whio again hosted this end of season gatherring of SCF member club's Champs. 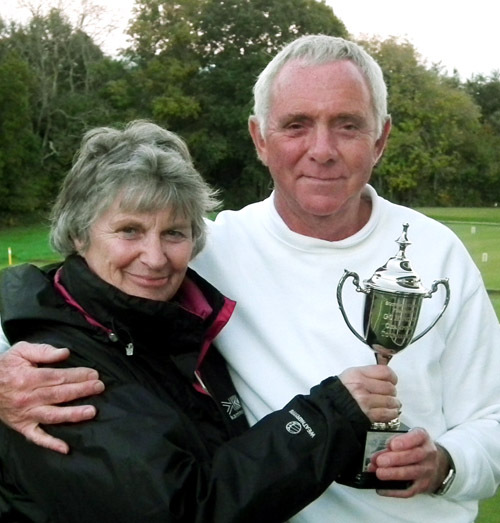 Norris is pictured here with Hamptworth Chairman Janet Trueman, who presented the trophy.